Who lived in a box. 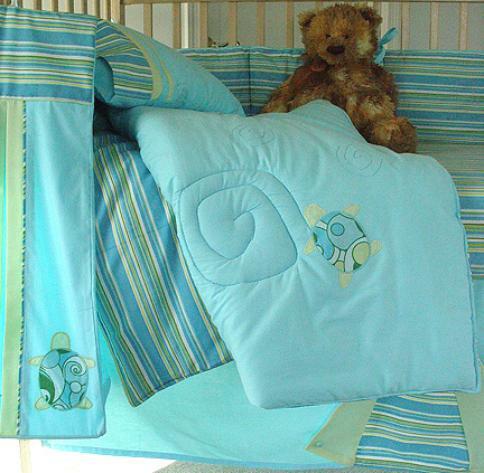 Turtle Twist crib bedding comes in beautiful watery shades of blues and greens that are easily adaptable to a baby boy or girl's nursery. 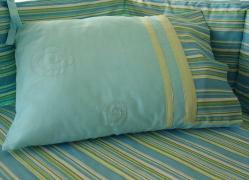 Fun little retro art sea green and yellow turtles swim throughout quilted swirling waves. 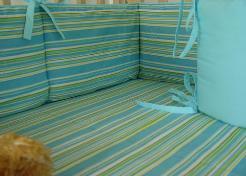 A striped crib sheet is complemented with striped bumper pads filled with high quality poly fill. Gentle and soft for you little one's protection. 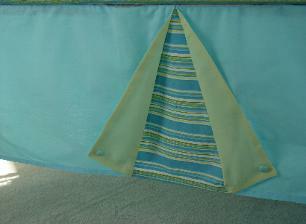 Soft blue solids combined with the multi colored stripes make this set a very clean and classic look. The Turtle Twist 7 piece ensemble comes with crib sheet, comforter, bumper, pillow, pillow cover, crib skirt and diaper stacker. All made from 100% cotton fabrics and hypoallergenic dyes. And that extra crib sheet for those messy days! Kentucky residents - 6% sales tax automatically added at checkout. 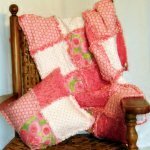 Don't miss out on new products, specials and nursery rhyme related articles!